As Miami Central Station continues to rise downtown, Jack Stephens, executive director of the South Florida Regional Transportation Authority, points to Tri-Rail making its grand debut at the station sometime next year. The South Florida Regional Transportation Authority, which currently operates the Tri-Rail commuter rail line, provides service to Miami-Dade, Fort Lauderdale and West Palm Beach through an existing 72-mile-long system that has 18 stations along the South Florida Rail Corridor running north and south. 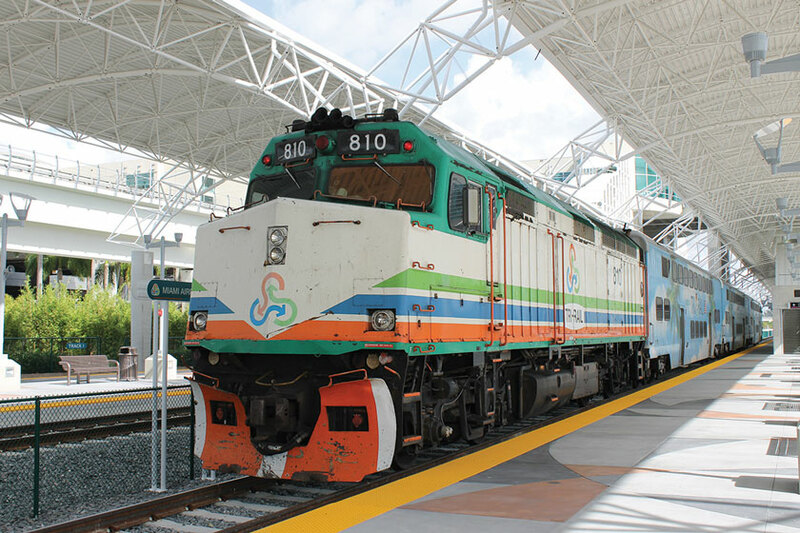 The trains also connect directly to Amtrak at numerous stations, and to Metrorail at the Tri-Rail Metrorail Transfer Station and at the Miami Airport Station. As a result, this new “Tri-Rail Downtown Miami Link” will utilize a 9-mile segment of existing railroad that runs through the city of Hialeah, Miami-Dade County and the city of Miami, while using sections of the South Florida Regional Transportation Authority and the Florida East Coast Railway corridor. The goal, once the new downtown Miami link is established, will be to run 26 passenger trains into Miami Central Station, which is set to be the home of All Aboard Florida’s Brightline. From the downtown Miami hub, both Tri-Rail and Brightline trains are to offer service throughout Miami-Dade, Fort Lauderdale, West Palm Beach. Brightline is to eventually reach Orlando. The purpose of the PTC safety plan is to prevent train-to-train collisions, derailments caused by excessive train speed, train movements through misaligned track switches and unauthorized train entry into work zones. However, he said, that timeline could change. There are so many factors that create and maintain the slow slog status quo of Tri-Rail. One huge factor is trains that basically are built to withstand worse conditions than a battle tank. The Federal Railroad Administration up to recently has required all passenger train cars to be built so strong that they are herrendously HEAVY and take forever and huge amounts of energy to accelerate from 18 stations. Recent revisions finally have somewhat changed these draconian and way outdated build standards. Also the Tri-Rail route is just 2 tracks so it is very difficult to run express trains. A third center track would facilitate express limited stop trains however this would entail rebuilding one side station facility at each station stop due to tracks taking w wider path. Unfortunately USA railroad mind set is still stuck just about 1919 so change and modernization is very difficult. The FRA is no help. Well Tri-Rail should be serving Miami again. Good. one less year of what will be more traffic nightmares at major intersections like NE 36th St. and SE 2nd Ave. those are bad now without the 26 trains a day. but, how much of the impetus for the second track was really for cargo containers with passengers as just an excuse and way of getting taxpayers to fund it? I’m sorry that service into MiamiCentral will be as late as next year. Like many retired people living in Broward, we want to visit often downtown Miami. Driving for older people has become more difficult. The unregulated craziness that occurs on I-95 makes it impossible to enjoy an afternoon in Miami. Hopefully I’ll still be able to enjoy visiting Miami on a regular basis when I can finally go directly to Miami without a complex and difficult (for me) transfer to MetroRail.